Today, September 29, 2017 is the final day to enter the Web Marketing Association’s 6th annual international MobileWebAward. If you have not entered already, now is the time to do so. Impress your friends, show off to co-workers, get a raise from your boss – theses things are all possible when you win awards. This is the “award” in “Award-Winning Mobile App or Website”. The entry form and complete information can be found at the MobileWebAward Competition website. Enter your best mobile work today and get the recognition you deserve! The Web Marketing Association Call For Entries for its 6th annual international MobileWebAward competition ends in one week (Friday, September 29, 2017). This award program recognizes the individual and team achievements of Web professionals all over the world who create and maintain the best mobile Websites and the best mobile applications. The entry form and complete information can be found at the competition website. Enter your best mobile work today and get the recognition you deserve! 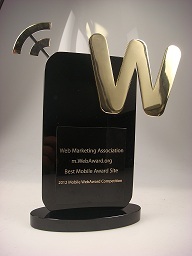 Two weeks remain to enter the Web Marketing Association’s 6th annual international MobileWebAward competition. The deadline for entry is Wednesday, September 29, 2017. This award program recognizes the individual and team achievements of Web professionals all over the world who create and maintain the best mobile Websites and the best mobile applications. The entry form and complete information can be found at the competition website. Enter your best mobile work today and get the recognition you deserve! The 21st annual international WebAward Competition for Website Development’s judging is now complete and the Winners have been posted to the competition website. The 6th annual MobileWebAwards is now accepting entries and the deadline for entry is September 29th. Our 16th annual Internet Advertising Competition will be accepting entries for the 2017 program starting in November, 2017 with a late January 2018 deadline. The Web Marketing Association is pleased to announce the winners of its 21th annual WebAward Competition for Web site development. Entries from 52 countries were adjudicated in 96 industry categories during this year’s competition. Entries were judged on design, copy writing, innovation, content, interactivity, navigation, and use of technology. 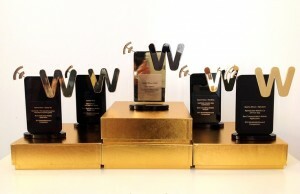 A complete list of the winning sites can be found at the WebAward Web site at www.webaward.org. The 2016 Best of Show WebAward is presented to [D³] Digital Design + Development, Hilton for their outstanding work on Waldorf Astoria Beverly Hills – At The Center of Extraordinary. The site was also recognized as Best Hotel and Lodging Website. [D³] built a property site for the new Waldorf Astoria Beverly Hills with the use of monochromatic colors, beautiful photography and typography, blended into a simple, sophisticated vibe. They focused on the architecture of the hotel and used it as a focal element to portray both the Beverly Hills culture and high-end quality. The result is a beautiful, clean website, rich with vibrant imagery that evokes all the feelings of a luxurious stay in Beverly Hills. Scorpion was named Top Agency at the 2017 WebAward Competition, taking home 38 WebAwards this year. The Top Agency Award is given to recognize the consistently outstanding development going on at interactive firms. Since being founded in 2001, Scorpion has become known throughout the industry for pushing boundaries—for making websites with technology that have never been seen before, for achieving results other companies thought were impossible. That passion for innovation and dedication to their clients has resulted in their team earning countless recognitions throughout the years, for our designs, for our results, and for the relationships that we have built with our clients. From receiving the Google Customer Satisfaction Champion award to winning hundreds of website design awards, they are proud of each and every honor. Not just for the award itself (although those are nice, too), but for what it means: their hard work, their commitment, and their drive. The agency was recognized in the 2017 WebAwards with Best Automobile Website, Best Healthcare Provider Website, Best Medical Website, Best Professional Services Website, 8 Outstanding Website WebAwards and 26 Standard of Excellence WebAwards. The competition was judged by a team of independent Internet professionals representing a variety of relevant disciplines of Web site development. Judges included members of the media, advertising executives, site designers, creative directors, corporate marketing executives, content providers and webmasters. The WebAward competition format allows Web sites to compete head to head with other sites within their industry to win the Best of Industry award. Entries also compete against a standard of excellence to win Outstanding Website and Standard of Excellence WebAwards. Each site is judged on seven different criteria and earns a score between 0 and 70 points. The highest score in a given category wins Best of Industry for that category. If the remaining entries receive a score of 60 or greater, they receive the Outstanding Web site award. Entries that score higher than their industry average and below 59.9 receive the Standard of Excellence. The 2017 WebAwards are sponsored by the following leading organizations: PR.com, EContent Magazine, iContact, SEO, Inc. and Website Magazine. The Web Marketing Association will also recognize the interactive agency winning the most awards in the MobileWebAward competition with the “Top Interactive Agency” Award this year. TMP Worldwide was named Top Interactive Agency for the 2016 MobileWebAwards competition. They received 11 awards, including: Best of Show Mobile Website, Best Employment Mobile Website, Best Marketing Mobile Website, Best Technology Mobile Website and 9 Outstanding Mobile Website Awards. Enter the MobileWebAwards and be recognized for your best work. There is only one month left before the Sept 29th entry deadline for the Web Marketing Association’s international MobileWebAward competition. If you want to boast about having “award winning” mobile apps and websites, this is the award you need to win! This award program recognizes the individual and team achievements of Web professionals all over the world who create and maintain the best responsive and mobile Websites and the best mobile applications. The entry form and complete information can be found at www.mobile-webaward.org. Enter your best mobile work today and get the recognition you deserve!